So if you have followed me for awhile, then you know that one of my Fall Bucket List items was taking family photos. You would also know that sending out Christmas cards was part of my Winter Bucket List. 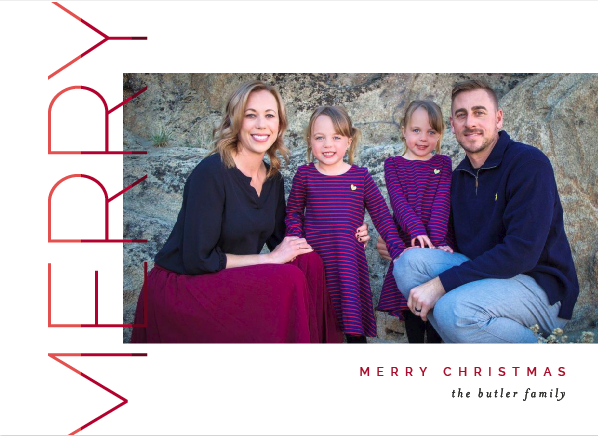 I didn't think we were going to get our Christmas cards out this year since we took our photos later in November, but Heather and Minted came through for me. While I don't have all of my photos ready to share with you all, I am going to share the process of choosing, creating, and perfecting your Christmas cards with Minted. First, you go to Minted's website and chose the kind of card you would like. We picked the Christmas photo cards. Then you can browse all the options you would like and finally pick one. I chose two different ones, built them and then let Rory chose the final option. I chose the Merry stacked because we love simple cards and this one stuck out to me. Once you chose your card, you can customize it. You will need to chose the size you would like. I chose 5" x 7". Then you will want to chose how many cards you would like (which changes the pricing). Next, you will chose the layout, greeting (Christmas), the color (I chose red), shape and then paper. Click Personalize and you can upload your picture. I chose one of the first photos we took. Then you can change the wording. I chose to change mine from Happy Holidays to Merry Christmas. Once your card is to your liking, I would recommend saving it. Click Next and you can customize the back. I chose to keep it simple and went with white. I almost chose red, but opted to leave it white. You can also write what your family has been up to or a special message. Click Next and you can customize the envelopes. I chose simple white envelopes, but chose to have Minted print all of my addresses for me. This will save me soooo much time. Plus they "design" an address that goes with your cards. Once you have chosen your address box, you can upload your addresses from a spreadsheet, use ones you have already uploaded or manually enter them. I keep my Christmas card list in a spreadsheet, so I just uploaded it with a few changes matching the requested columns. You will get to preview one of them once it is uploaded. Click Next and you can preview and add your design/card to the cart. If you want to speed things up, you can opt out of them sending you a sample Christmas card. Then simply checkout and wait for your beautiful cards to arrive. Aw your Christmas card looks great! The girls dresses are absolutely adorable on them! They love those dresses and so do I. Thank you for your sweet comment. That is the PERFECT card! I love how it turned out! I love when it's easy to create cards. Yours came out great! Super cute cards this year! I tried out Staples since I had a Groupon and they turned out well also! Good to know the Minted is always an option! I am always up for a deal. Glad yours turned out beautiful as well! Love the card! The girls look so cute in their little dresses. Beautiful family! Thank you. It is from Amazon. I love how the cards turned out. Cute, cute, cute!!! I used Minted, too, and loved them! Awesome. I will need to check yours out. Your Christmas cards came out beautifully this year! We used Minted last year, and it was a great experience. We chose to go with Basic Invite this year based on a great experience with them earlier this year, and that was awesome, too! I love that there are so many options! Your card is beautiful!! And that picture of y'all is even better! The girls look so grown up! They really do. I can't believe it. Thank you so much! I love how they came out! Your coordinating outfits look perfect and I love the clan look of the design you chose! I used minted for my mom's surprise party invites and you cannot beat their customer service! Such a wonderful picture. I have used minted for five years, I need to figure out how to get sponsored! They reached out to me this time, so that was nice. They have great cards. Thanks for sharing! I have wondered about ordering from somewhere other than Costco. Does Minted have good deals? Your family picture is beautiful, Danielle!!! Eek, I’m so excited, this is such a beautiful photo! Your color skirt is incredible and blends with everyone so well. You all look precious! Beautiful family and pretty card!